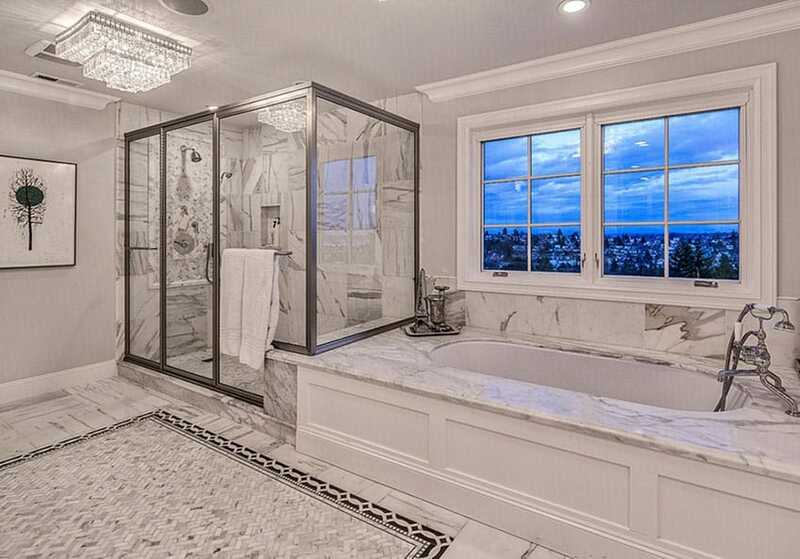 Welcome to our gallery of bathroom chandelier ideas. 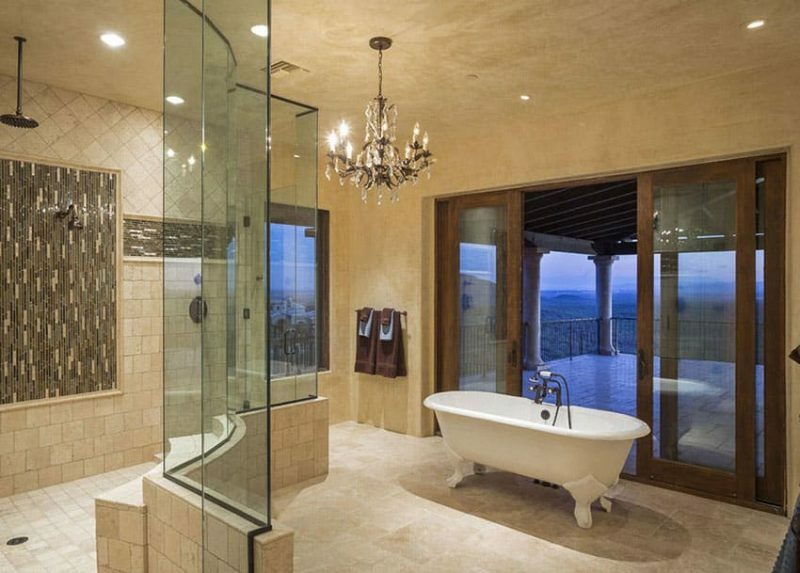 A bathroom chandelier can bring a feeling of luxuriance to your space and help you create the ultimate relaxing retreat. 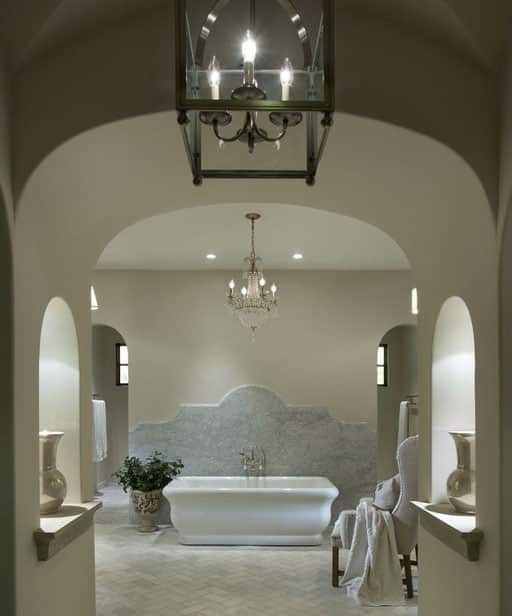 On this gallery page we share beautiful pictures of luxury bathrooms with high-end furnishings & decor with gorgeous chandeliers. While chandeliers are more often seen in locations such as dining rooms and entryways they can add a lot of personality to a bathroom space. Chandeliers are similar to pendant lights in that they are often made of the same materials and use the same type of lights. However, chandeliers have a branched fixture while pendants hang by a chain, or cord. In the image above is a beautiful crystal chandelier with matching crystal wall sconces. 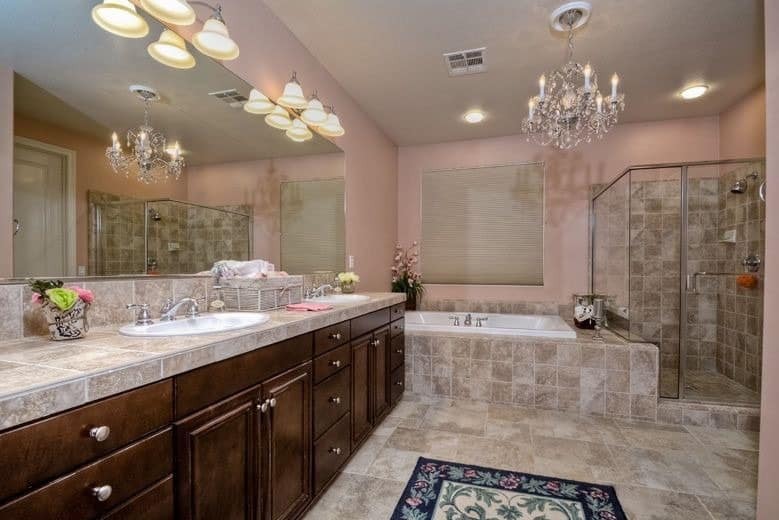 The luxury master suite has polished travertine flooring, a large soaking tub, double sink vanity with white cabinetry, and a large glass shower with arched ceilings. Scroll below for more bathroom chandelier ideas. Traditional – They are elegant with a formal style using detailed scrolling and the highest quality materials. Tiered – Have a light for each tier. Therefore the more tiers this type has the bigger it is. A tiered chandelier can come any any style from contemporary/modern to traditional. Mini – These light fixtures are a popular choice for the bathroom as their smaller size makes them ideal for an intimate space. Similar to a full size fixture, mini chandeliers are often used in bedrooms and closets to enhance the area and provide a sense of style and elegance. Crystal – Glamorous is a great way to sum up the look of a crystal chandelier. They can also be expensive if constructed using real crystals. They are eye-catching and dazzling as light reflects off of each crystal. Crystal chandeliers are amazing for creating an aura of romance to a room. Drum – Featuring one or multiple lampshades, a drum chandelier has a shade that completely surrounds each light or the entire fixture. They are similar in appearance to a pendant light. Contemporary & Modern chandeliers – Sleek and stylish are two words that define a contemporary/modern chandelier. With clean lines, straight edges and modern materials these light fixtures can really add your own personal flair to a bathroom space. Rustic – With a casual style these types of light fixtures often have distressed or burnished finishes. They can even have rustic materials such as branches, tree branches, animal horns and old fashioned sconces and characteristics. Transitional – A mix of modern and traditional, a transitional chandelier is widely adaptable and can most often fit in with any decor or design style. 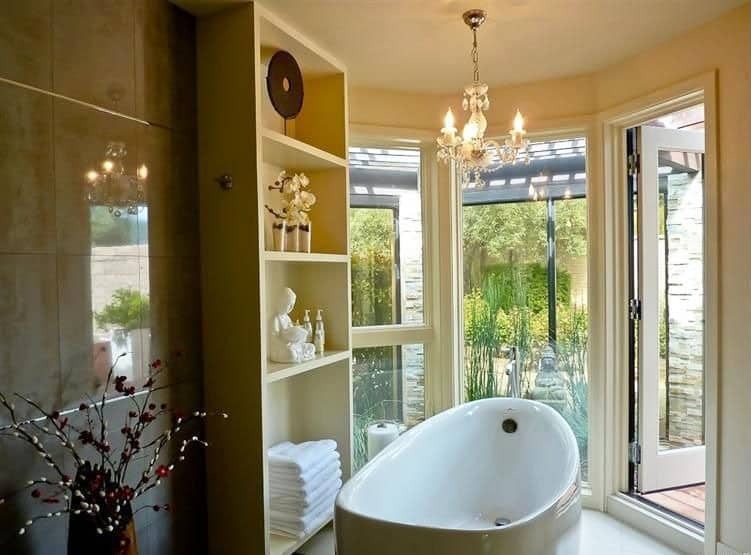 This gorgeous master bathroom has a stunning crystal chandelier with a white clawfoot bathtub that views out through sliding doors to an outdoor balcony area. This traditional master bathroom has an ornate crystal style chandelier overlooking a large bathtub enclosure, built-in mirror globe lighting, glass rainfall shower, and dual dark wood vanities. This contemporary chandelier is a drum style that pairs well with the modern and sophisticated look of the bathroom space with its window sitting nook, and grey laminate flooring. 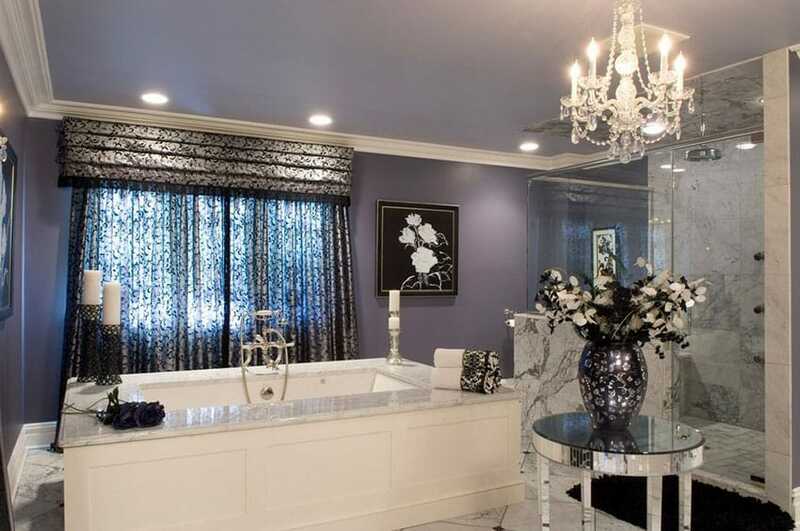 This glamourous bathroom suite is enhanced by the mini chandelier with crystal style glass, purple painted walls, dark floral drapery, chrome fixtures, silver table, marble tiles shower, and large marble topped soaking bathtub. This modern chandelier is suspended above a large bathtub enclosure with a rounded room with picture windows surrounding the space and providing an exceptional view of the gold course and nearby mountainside. 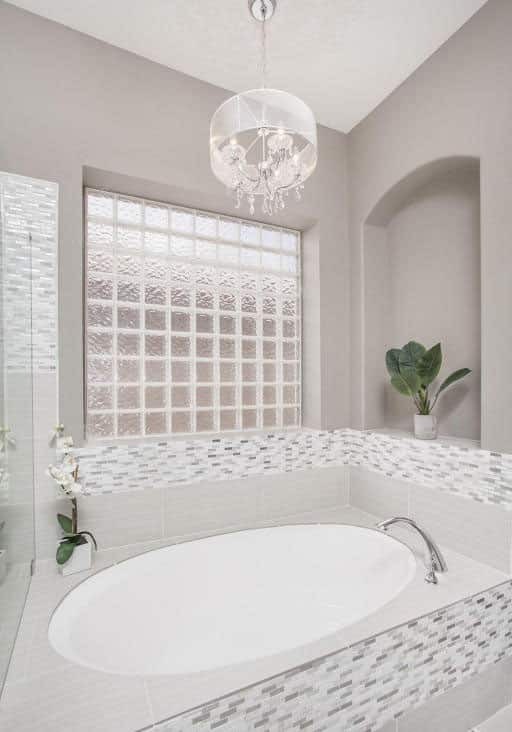 A lovely master bathroom with white marble, detailed herringbone style tile flooring, large enclosed bathtub, oversized shower and a low profile contemporary chandelier with a two rectangular sets of glass. A light and bright bathroom with an enclosed tub, marble slab surround, marble tile backsplash and a gold mini chandelier. 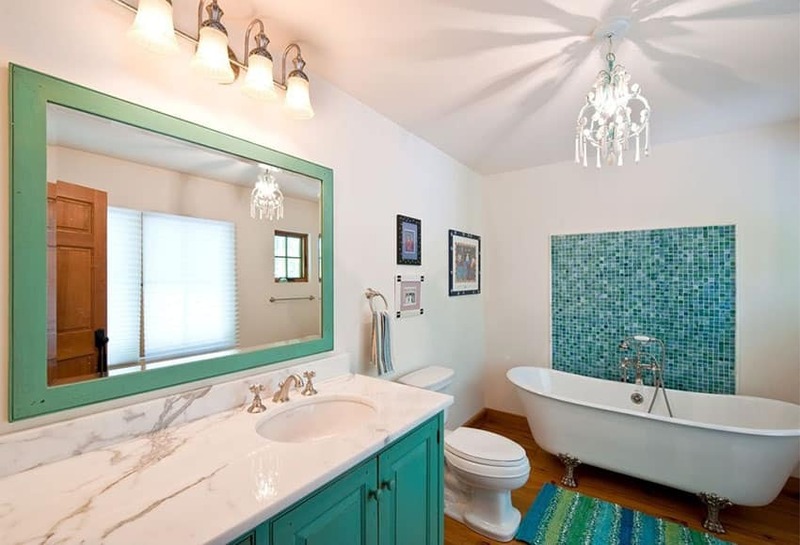 This bathroom is whimsical and colorful with its choice of aqua green paint on the vanity, mirror and mosaic tile accent wall. 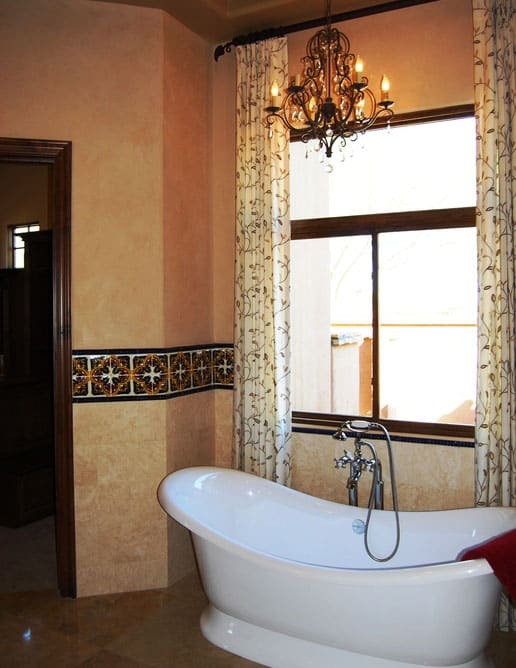 The mini chandelier helps to brighten the mood even more and looks inviting suspended above the claw foot bathtub. This contemporary chandelier features large glass balls in an upward facing pattern suspended by chains and provides a warm illumination to the bathroom area. Shaded wall sconces in the walls also help provide a warm glow and bring needed light to the sink area. 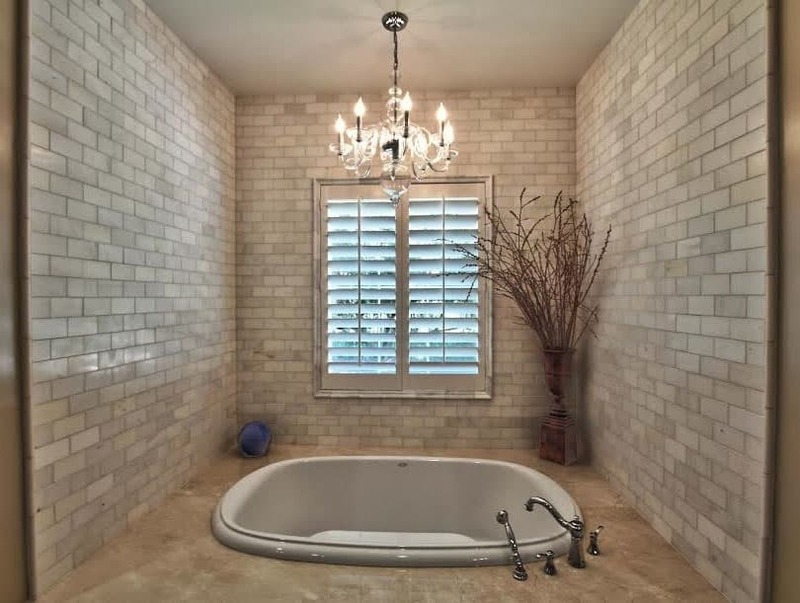 This tiled bathtub nook is made even more inviting by the mini chandelier’s soft light to set the mood. A louvered window brings in natural light and provides privacy when needed. This rustic and ornate burnished brass chandelier with hanging crystals looks amazing above this contemporary master bathroom suite. 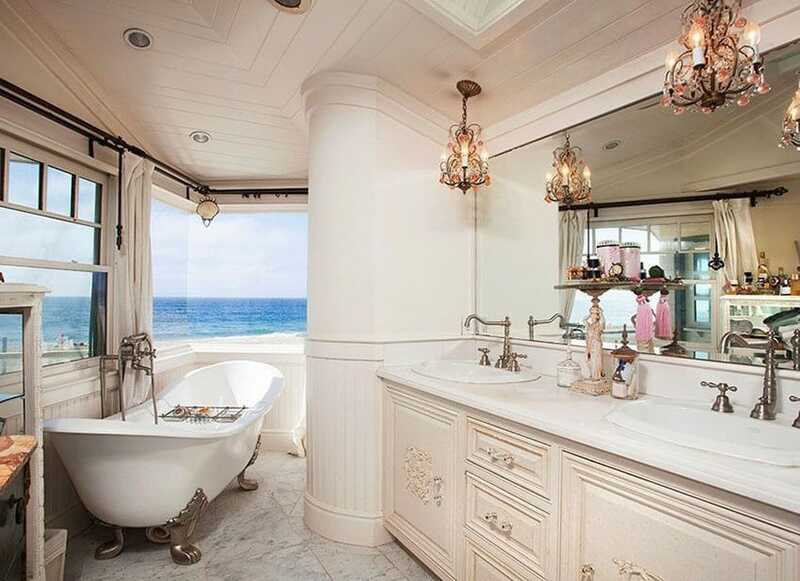 Two mini chandeliers with pink glass provides this traditional bathroom an elegant feel as guests gaze out upon the stunning ocean view. A drum style chandelier with a chrome fixture is a great touch for this mosaic tiled bathroom. 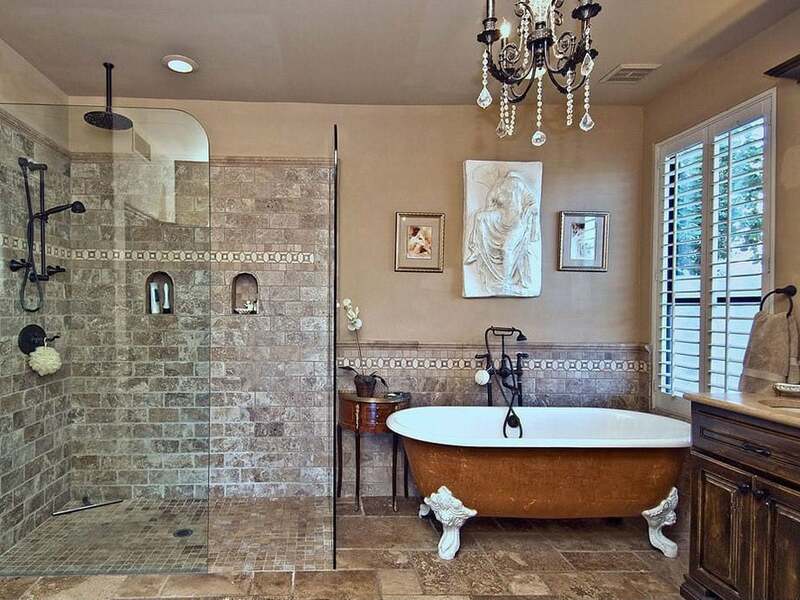 Extravagant is one way to describe this amazing master bathroom. The large crystal chandelier is impressive with its hanging glass work of intricate beads. 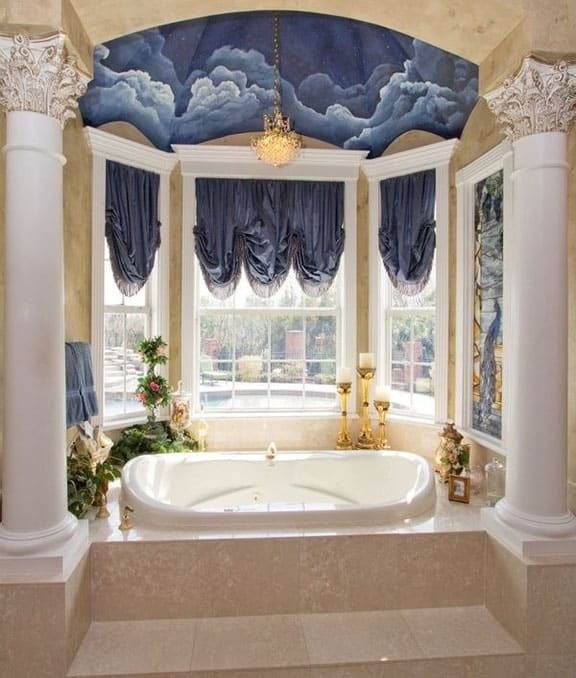 A mini brass chandelier looks fabulous in this elaborately decorated bathroom, complete with wide detailed pillars, large tile steps, picture window and arched painted ceiling with a painted clouds mural. 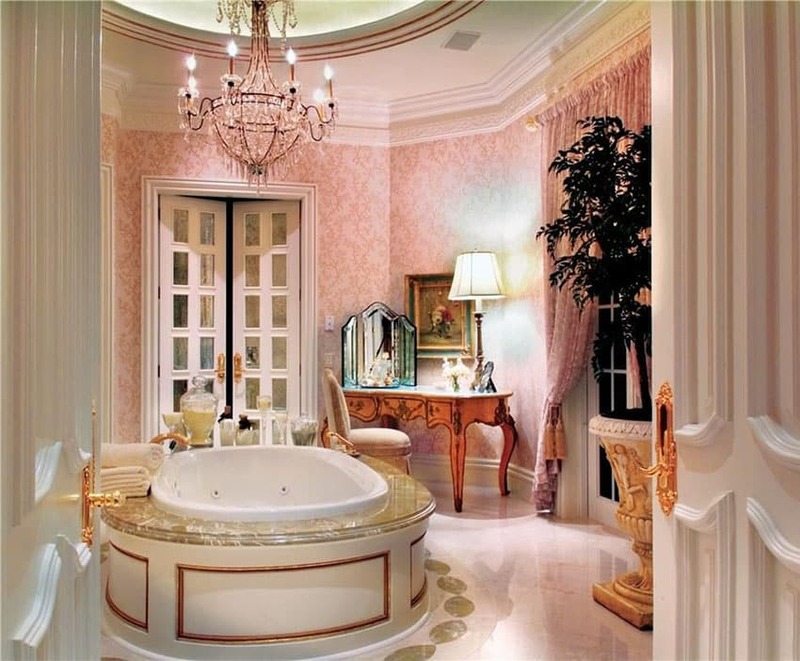 This luxurious bathroom space is inviting and majestic with its elevated claw foot bathtub and beautiful crystal chandelier. 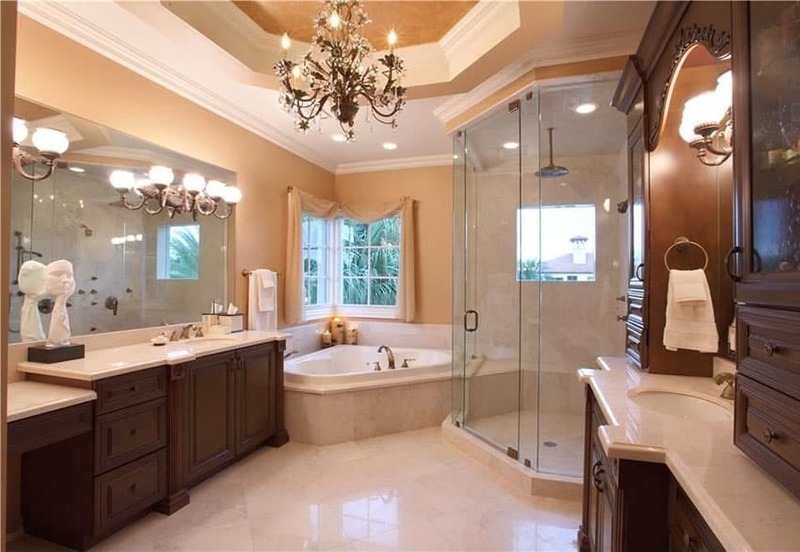 Bathroom chandelier ideas with high end lighting fixtures make a lasting impression and definitely help when selling a home and for your everyday enjoyment. The traditional style chandelier really increases the sense of luxury in this bathroom and complements the three pronged wall fixtures and silver hardware. This wire frame chandelier is small and delicate and looks great in this bathroom with soft white tile and cream cabinets. A modern drum chandelier with three tiers or glass prisms to provide plenty of dazzling light. 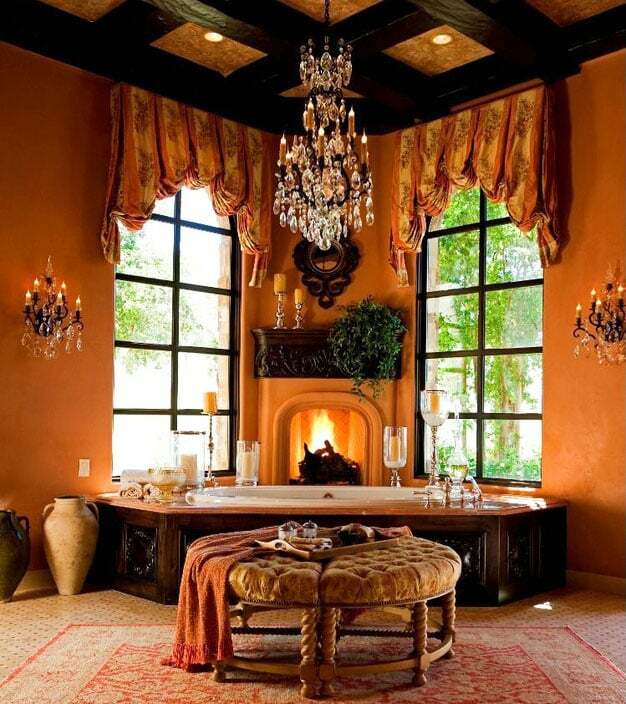 This elegant bathroom is warm and inviting with their choices of warm oranges and red colors with corner fireplace, natural wood finishes and tall windows leading to an exposed beam coffered ceiling. The dramatic hanging glass chandelier is stunning and matches two additional wall mounted chandelier fixtures to fill the room with a soft glow. This rustic chandelier is perfectly positioned over the bathtub and framed by the large window view. 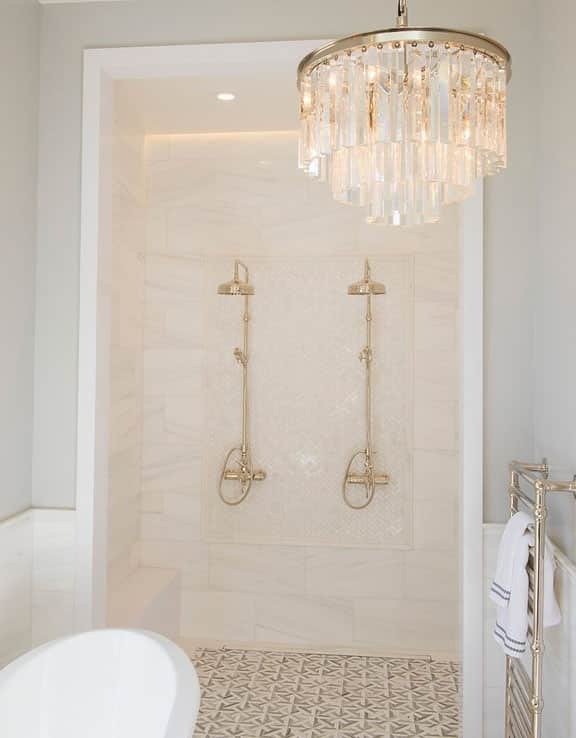 A burnished brass chandelier with hanging bead strands with a large crystal at the ends is an attractive centerpiece for this luxury Mediterranean style bathroom. 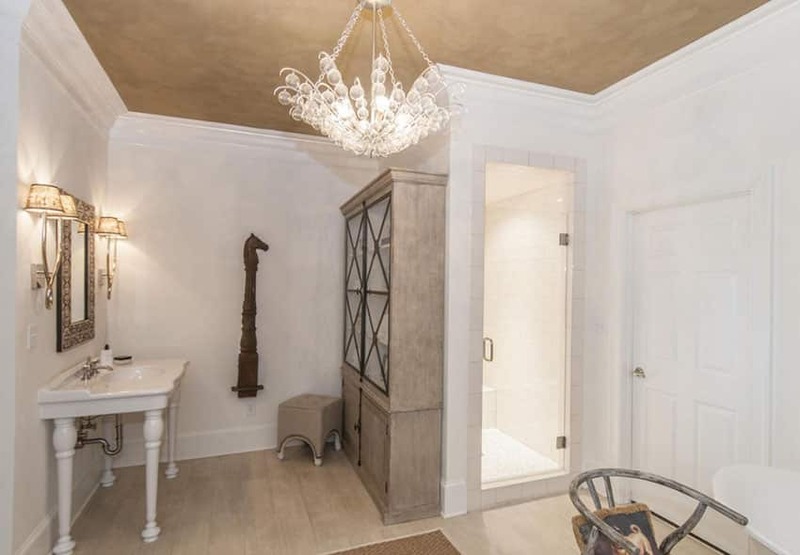 This romantic open bathroom master suite is enhanced by the glass chandelier with intricate strands and light brass fixture. The warm glow from this small chandelier is soothing and can be complimented from the warm glow of candle light to bring a soothing sense of serenity to the space. This Asian influenced bathroom area has plenty of natural light with its corner of floor to ceiling windows. 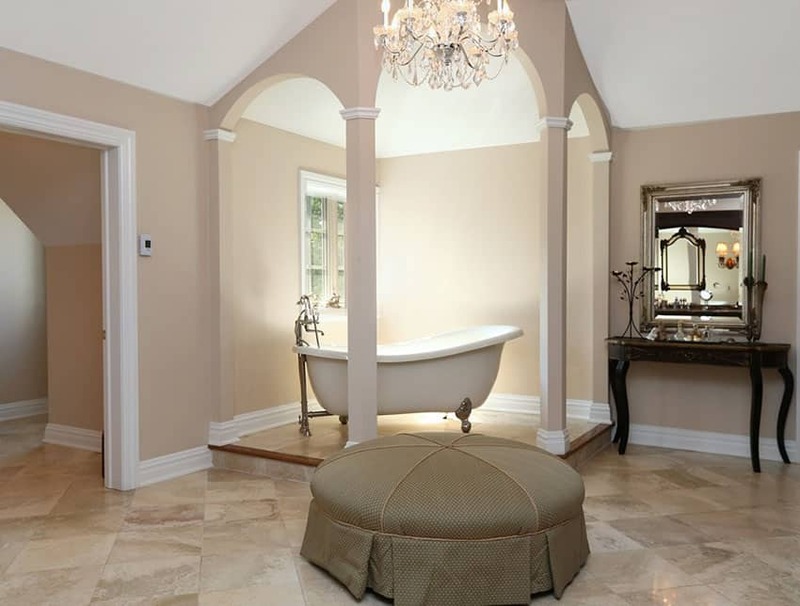 The mini chandelier is situated directly above the bathtub and really helps top off the feel of a spa like environment. 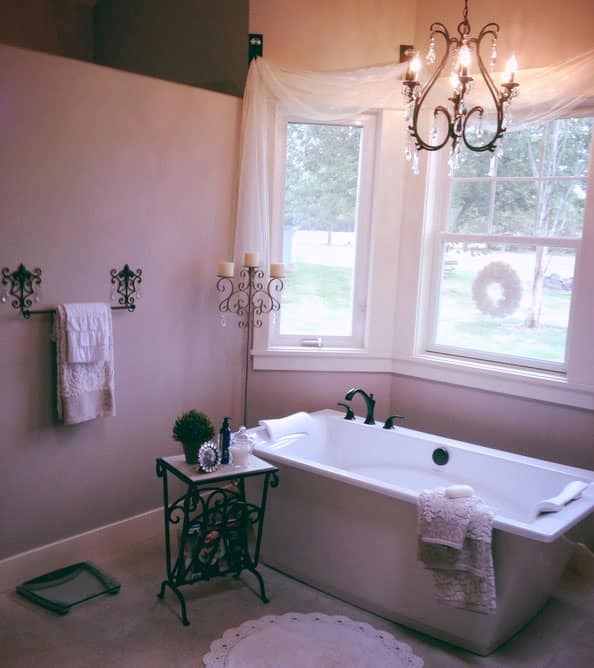 This elegant bathroom has room for two while soaking in the large tub, luxuriating in the shower, or relaxing on the daybed. An elegant ornate chandelier in a dark metal patina enhances the feeling of luxury and opulence.